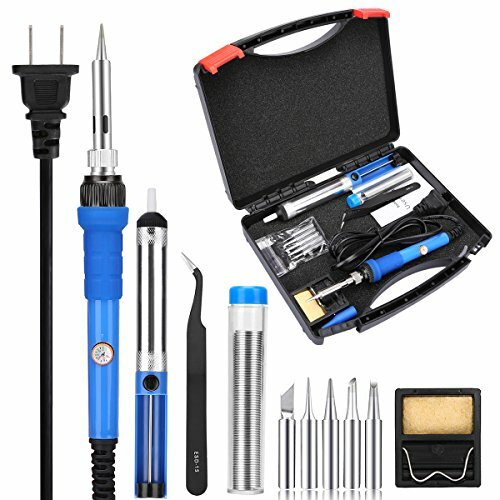 KEDSUM Version-Ⅱ soldering iron kit are pretty handy for both beginners or the experienced who need a portable solution. 1. Before use. Replace the tips to ensure tight enough; Prepare all solders and soldering iron; Suggest to start with low temperature at 300℃ for the first time. 2. Heat up. Plug in, coat with the wire on heated parts (not tips) till solder melts to test then select a fit temperature ASAP since the iron heats up fast; Clean with wet sponge for ready. Press the desoldering pump until hearing the click sound, put the tip and pump close enough to the joint, when the solder melt and flow freely, click the pump quickly, remove ASAP. If necessary, repeat the steps. 1. Do not replace the tip when heating to avoid burning. 2. Do not heat the iron when not use, should power off and cool it if necessary, otherwise will shorten its life. 【FAST HEAT UP and HEAT DISSPATION】 60 watts 110V welding soldering gun can fast heat up within 2 minutes. Adjustable temperatures is 200~450℃ (392℉ to 842℉). With upgrade steel-pipe design, enhance heat dissipation, cool down the iron quickly. 【DESOLDERING PUMP】The desoldering pump (solder sucker) made of high pressure vacuum tube with aluminum body frame, can allows easy one-handed use. Best for removing solder from circuit boards. 【LED INDICATOR and TOOLBOX】LED indicator shows working status to avoid burning, make your soldering job more safety and simple. Carry case is rather convenient to store small tools and easy to carry, which can avoid losing the soldering gun and accessories. 【WIDELY APPLICATION】The soldering sets are suit for DIYER and home repairs, widely use of electronics and circuit boards, wire soldering, jewelry, electrostatic sensitive components, computers hardware, small electronic work or more. If you have any questions about this product by KEDSUM, contact us by completing and submitting the form below. If you are looking for a specif part number, please include it with your message.